As a solo artist I've supported Paul Young, Chas and Dave and the Wurzels to name a few! You can read more about me and my music in the Bio section at the foot of this page. I am initially trying to raise money to fund new equipment for my home studio, to enable me to record my 3rd album "333". This will allow me to do the pre-production at home saving a fortune on studio fees and will also be usable on forth-coming albums. 'Mixing' - Take the album to a studio to be professionally mixed. I would prefer someone with more experience than myself to do this, as it is a real art. 'Mastering' - Have the album mastered, so it basically sounds the best that it can be on all systems. There are a number of ways you can help to fund my 3rd album "333"
Buy a cd or digital download from the store. (the 3rd album "333" is a pre-order. Make a one off donation with my heartfelt thanks! Subscribe to one of three subscription packages for exclusive rewards. PRE-ORDER CHRISTIAN SLEEPS NEW ALBUM "333"
A digital download or cd of the album "333" when released. This is for people who would like to get involved in hearing updates of the recorded music, etc as the process goes along. These will be emailed to you once a month via email in mp3 format. Address Line 1 Address Line 2 Town/City Postcode Country AfghanistanAlbaniaAlgeriaAmerican SamoaAndorraAngolaAnguillaAntarcticaAntigua and/or BarbudaArgentinaArmeniaArubaAustraliaAustriaAzerbaijanBahamasBahrainBangladeshBarbadosBelarusBelgiumBelizeBeninBermudaBhutanBoliviaBosnia and HerzegovinaBotswanaBouvet IslandBrazilBritish lndian Ocean TerritoryBrunei DarussalamBulgariaBurkina FasoBurundiCambodiaCameroonCanadaCape VerdeCayman IslandsCentral African RepublicChadChileChinaChristmas IslandCocos (Keeling) IslandsColombiaComorosCongoCook IslandsCosta RicaCroatiaCubaCyprusCzech RepublicDenmarkDjiboutiDominicaDominican RepublicEast TimorEcuadorEgyptEl SalvadorEquatorial GuineaEritreaEstoniaEthiopiaFalkland Islands (Malvinas)Faroe IslandsFijiFinlandFranceFrance, MetropolitanFrench GuianaFrench PolynesiaFrench Southern TerritoriesGabonGambiaGeorgiaGermanyGhanaGibraltarGreeceGreenlandGrenadaGuadeloupeGuamGuatemalaGuineaGuinea-BissauGuyanaHaitiHeard and Mc Donald IslandsHondurasHong KongHungaryIcelandIndiaIndonesiaIran (Islamic Republic of)IraqIrelandIsraelItalyIvory CoastJamaicaJapanJordanKazakhstanKenyaKiribatiKorea, Democratic People's Republic ofKorea, Republic ofKosovoKuwaitKyrgyzstanLao People's Democratic RepublicLatviaLebanonLesothoLiberiaLibyan Arab JamahiriyaLiechtensteinLithuaniaLuxembourgMacauMacedoniaMadagascarMalawiMalaysiaMaldivesMaliMaltaMarshall IslandsMartiniqueMauritaniaMauritiusMayotteMexicoMicronesia, Federated States ofMoldova, Republic ofMonacoMongoliaMontenegroMontserratMoroccoMozambiqueMyanmarNamibiaNauruNepalNetherlandsNetherlands AntillesNew CaledoniaNew ZealandNicaraguaNigerNigeriaNiueNorfork IslandNorthern Mariana IslandsNorwayOmanPakistanPalauPanamaPapua New GuineaParaguayPeruPhilippinesPitcairnPolandPortugalPuerto RicoQatarReunionRomaniaRussian FederationRwandaSaint Kitts and NevisSaint LuciaSaint Vincent and the GrenadinesSamoaSan MarinoSao Tome and PrincipeSaudi ArabiaSenegalSerbiaSeychellesSierra LeoneSingaporeSlovakiaSloveniaSolomon IslandsSomaliaSouth AfricaSouth Georgia South Sandwich IslandsSpainSri LankaSt. HelenaSt. Pierre and MiquelonSudanSurinameSvalbarn and Jan Mayen IslandsSwazilandSwedenSwitzerlandSyrian Arab RepublicTaiwanTajikistanTanzania, United Republic ofThailandTogoTokelauTongaTrinidad and TobagoTunisiaTurkeyTurkmenistanTurks and Caicos IslandsTuvaluUgandaUkraineUnited Arab EmiratesUnited KingdomUnited States minor outlying islandsUnited States of America (USA)UruguayUzbekistanVanuatuVatican City StateVenezuelaVietnamVirgin Islands (British)Virgin Islands (U.S.)Wallis and Futuna IslandsWestern SaharaYemenYugoslaviaZaireZambiaZimbabwe Home phone Mobile number I consent to Christian Sleep sending me marketing emails. Thank you for supporting Christian Sleep! I will try to keep this brief... I'm a self taught singer, pianist and guitarist from Plymouth UK . 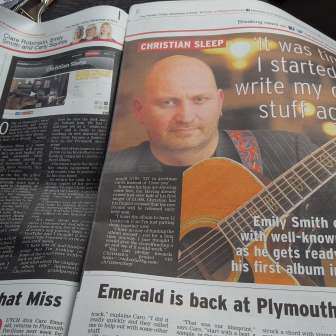 I've been making a living from music for 18 years-starting out as a keyboard player with various bands and busking the streets of Plymouth. As a solo artist I've supported Paul Young, Chas and Dave and the Wurzels to name a few! I've experienced some ups and downs over the years but I am certainly over the worst of it. By playing music on the streets for 10 years I discovered a great way of developing my craft. This lead on to performing on the local pub circuit as a solo artist and I continue to truly appreciate the support I receive from these gigs.